On the eve of the Eurasian Economic Union (EEU) summit, which took place on December 23in Moscow, Belarus President Alexander Lukashenko lashed out at Russia’s policy, calling it “silly and stupid.” His anger was at restrictions Moscow had imposed on certain imports from his country, along with many other points of friction between the two “brotherly” nations. A few days earlier, Lukashenko had ordered customs checkpoints to be reinstated on the Belarusian-Russian border, and announced that bilateral trade would be carried out in U.S. dollars. Chairman of the Party of Patriots of Kazakhstan, Gani Kassymov, in turn, called on the government of Kazakhstan to “postpone the introduction of the Eurasian Economic Union norms for a year, to a time Russia’s economic situation recovers. Kazakhstan cannot maintain economic fraternity with Russia following the latter’s economic collapse. The Russian crisis will deteriorate the economic situation in Kazakhstan and Belarus.” Kazakhstan is already feeling the chill: imports from Russia are now worth $17.7 billion, whilst Kazakh exports are worth $5.8 billion (following a 21 percent decline in Kazakh exports in the first half of 2014, compared to the same period in 2013). All this seems bad enough, but most experts and observers, let alone the public, have failed to focus on one crucial point: the EEU won’t just allow the cross-border free flow of goods, capital and labor; Belarus and Kazakhstan will now also be exposed to Russian organized crime, penetrating the countries’ businesses and government structures, which have hitherto been under the tight control of authoritarian leaderships. In Belarus, the common feeling is that the streets and avenues of Minsk are clean and well-kept, medical services are fine, and policemen are “real” – not like Russia’s bent cops. The concern about what might happen may explain why Lukashenko, when faced with Moscow’s ban on Belarusian meat and dairy products, bluntly questioned Putin’s ability to fight “crooks feathering their nests” off bilateral trade. Or, he assumed, perhaps Moscow was using a combination of politics, shady schemes and “internal forces” as foreign policy instruments. Astana has a lot to lose as well. In spite of all the ups and downs of Kazakhstan’s transformation to a market economy, the nation has risen 47th place on the World Bank’s Competitiveness Index and 50th place in the Ease of Doing Business rating. Red tape is consistently being cut, thanks to the effective implementation of the e-government concept: Kazakhstan has climbed to 28th place in the UN e-government ranking. Most importantly, the mindset of the majority of Kazakh citizens is market-oriented. Kazakhstan’s entrepreneurs have already become accustomed to working under more or less civilized rules. President Nursultan Nazarbayev claims his nation is ranked among the world’s 20 most attractive countries for foreign investment. Russian organized crime groups have long been known for taking advantage of economic and social crises and reforms to increase their influence and wealth. And any initiatives by Russian criminals to get in touch with their counterparts in Kazakhstan, to prepare the ground for the common market, may well find that the soil is fertile. While Kazakhstan gradually climbs the business and investment climate rankings, it is making much slower progress in the fight against corruption – according to Transparency International, the country ranked 126th in the Corruption Perceptions Index in 2014, compared to 140th in 2013. By Putin’s definition, a “fifth column” means internal forces serving Western interests and undermining stability in Russia. However, popular opinion is that Russian oligarchs, merged with criminal groups, play the same role in advancing Moscow’s interests in its near abroad, as in Ukraine. 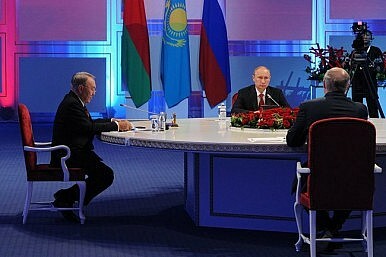 Nobel Laureate Paul Krugman’s observed that “Putin’s Russia is an extreme version of crony capitalism, indeed, a kleptocracy in which loyalists get to skim off vast sums for their personal use.” Not surprisingly, then, many Belarusians and Kazakhs see and fear the political consequences of the EEU, especially against the backdrop of the Ukrainian crisis. Jan Dulac is a freelance writer, based in Astana, Kazakhstan.